University of Mustafa Kemal, Faculty of Fisheries, Department of Seafood Processing Technology, Hatay -Turkey. Meat yield, flesh colour, proximate and mineral compositions, and fatty acid profile of cap-tured and wild greater amberjack were investigated. Meat yield and flesh colour of wild and cultured greater amberjack were similar. However, their proximate compositions were differ-ent. Most of the fatty acid composition of the wild and farmed fish were significantly different (P0.05) from each other, except C14:0; C20:2 n-6; C20:3 n-6; C20:5 n-3; C22:5 n-3. The levels of linoleic acid and erucic acid were the key fatty acids discriminating cultured fish from the wild counterpart. The ratio of total n-3:n-6 fatty acid was 5.5 and 4.15 in the wild and farmed fish respectively. Macro elements level was much greater in the wild fish compare to cultred fish with the exception of calcium. Among the trace elements, iron was the foremost trace element followed by zinc, copper, barium, lead, manganese, and cadmium. The history of the marine aquaculture sector in Turkey dates back to 1985. Initially, a sea bream and sea bass hatchery was established by a private company in the Aegean Sea. First official aquaculture statistics were published in 1986 and marine fish culture was reported as 35 tons in Turkey. Total fish production volume in year 2008 was about 646,310 tons and almost 152,186 of this production originated from the aquacul-ture sector (Deniz et al., 2009). It is expected that this value will increase in the near future by adapting alternative species to aquaculture. 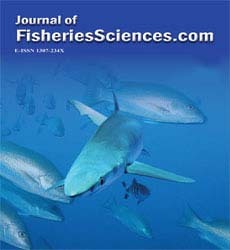 Recent research and development activities in private hatcheries concentrated on new or alter-native Mediterranean species, namely common dentex (Dentex dentex), common sea bream (Pagrus pagrus), common pandora (Pagellus erythrinus), sharp snout sea bream (Puntazzo puntazzo), white grouper (Epinephelus aeneus), shi drum (Umbrina cirrosa), striped sea bream (Lithognathus mormmyrus), meagre (Argyyroso-mus regius), greater amberjack (Seriola dumerili, Risso 1810), brown meagre (Sciena umbra), white sea bream (Diplodus sargus) and two-banded sea bream (Diplodus vulgaris). Some hatcheries market common dentex, common pan-dora, sharp snout sea bream and meagre fries in the size range of 1-8 g, and have successfully produced a few hundred tons in cages (Okumus, 2007). Among these alternative native species, greater amberjack is one of the most favourable fish, because of its high growth performance, ex-cellent flesh quality, high protein content, and meat yield. In addition to these attributes, it is easy to use on the processing line for filleting and portioning due to its body shape. These positive properties of greater amberjack make it a favour-able fish for future aquaculture sector. Our pre-liminary study revealed that canned greater am-berjack also attracted great attention by panellists with its mild flavour. Wild greater amberjack is one of the most popular fish in North-East Mediterranean mar-kets. However, supply of this fish species is lim-ited due to the low catch rate and being season dependant. By adapting this species to a culture environment may be a better solution to fulfil this high demand. Recently, a first attempt was made to farm greater amberjack in the North East Mediterranean Sea on a project basis which was funded by TÜBITAK and run by Mustafa Kemal University, Fisheries & Aquaculture Faculty in Turkey. Most of the studies on farmed Mediter-ranean greater amberjack are related to its cul-ture, diseases, and biology. However, limited studies are available for meat yield and bio-chemical composition of cultured and wild greater amberjack. Thus, determination of some nutrient compositions and meat yield of both cultured and wild greater amberjack is the main objectives of this research. Wild Mediterranean amberjack (Seriola dumerili) were caught by local fishermen using long line in Iskenderun Bay in Turkey. Fish were purchased from the fisherman (Turkey) in early morning soon after the fish arrived to market in December. The fish were transferred to the labor-atory by maintaining cold chain. Farmed amber-jack were raised in a floating fish cage and fed with an commercial fish feed (Çamli yem) in the same bay for a year and harvested on the same month as captured fish. Average fork length and total weights for wild and cultured amberjacks were measured to be 42.3 ±1.5 cm, 877±63 g and 40.1 ±4.62 cm, 870±165 g respectively. Proxi-mate analyses were done on the same day and fatty acid methyl esters were prepared freshly extracted lipids. Fatty acid methyl esters were stored in amber vials at-20°C for further analysis. Fish were filleted to measure the colour and measurements were done inner side of the fillet. The flesh of cultured and wild Mediterranean greater amberjack was analysed for proximate composition: moisture content by air drying (AOAC, 1997; method 950.46), total lipid by modified Bligh & Dyer method (Hanson and Ol-ley, 1963), and crude protein was determined by the Kjeldahl method using an automatic Kjeldahl system (Gerhard, Vapodest, Germany). Crude protein content of greater amberjack was calcu-lated indirectly by multiplying the amount of to-tal nitrogen by factor 6.25. Crude ash was deter-mined by incineration in a muffle furnace (Nuve, Turkey) at 550 °C for 8 h. Crucibles were brought about the room temperature and weighted. Approximately 30 mg lipid was added to ac-curately weigh total lipids. Further, the mixture was saponified by 0.5 M KOH in methanol, and methylated by methanolic BF3 (14%) to obtain fatty acid methyl esters (FAMEs). The FAME were analysed with HEWLETT PACKARD 6890 GC-MS instrument equipped with a HP-Innowax PEG capillary column (HP 19091N-133), Injec-tion and detector temperatures were set at 250°C and at 270°C respectively, with a split ratio of 1:50, split flow was maintained at 9.9 ml/min with a total flow of 13.9 ml/min. Helium was used as a carrier gas. Oven temperature was maintained at 70°C for 1 minute then, increased to 180°C at 20°C per minute finally reached to 220°C with an increment of 3°C per min and held at this temperature for 9 minutes. Total separa-tion of fatty acids was achieved in 30 min. Indi-vidual FAMEs were identified by reference to fish oil standard (Supelco 47085U PUFA No.3) and Supelco 37 component FAME mix (47885U). Further confirmations of fatty acid methyl esters were also done by using MS data base library (FAMEDBWAX). A relative amount of each fatty acid methyl ester was expressed as a percentage of the total amount of FA in the ana-lysed sample. Three fish were filleted for each group and meat yield was calculated as a percentage of the edible fish fillet weight to the total body weight. Colorimetric analysis was carried out with a Chromo-meter CR 400 (Minolta, Osaka, Japan) giving results in CIE values for lightness (L*), associated with the brightness intensity of the stimulus, chromo ((a*2+b*2)1/2), in relation with the proportion of pure colour, and the angle of hue (tan-1(b*/a*) pertaining to the predominant colour (Hutchings, 1994). The measurements were taken from the internal side of the fillets. Each measurement was done above the backbone and from three anatomical locations namely; an-terior, posterior and caudal parts. L*, C and H values were recorded from tree individual fish fillets of farmed and wild fish. The white stand-ard board (Y=93.5, x = 0.3124, y = 0.3190) was used for calibration. Three fish were filleted from each group and the fillets were homogenised and triplicate sam-ples were taken for cultured and wild specimens. 2 g of sample were placed into a 50 ml polyeth-ylene screw capped tube. Seven ml of concen-trated (65%) HNO3 (supplied from Merck) and 1 ml of H2O2 (30% v/v) were added and then left for one night. The digests were subjected to a hot water bath at 70°C for 7 h and then further diges-tion by holding the extract in an ultrasonic bath at 70°C for 10 min. Finally the digests were filtered through ash-free filter paper and the volumes of the digests were made up to 25 ml with ultra pure water. All utensils used for this purpose were cleaned in an acid bath (1:9 HNO3: distilled wa-ter v/v) and rinsed with ultra pure water. Ele-ments were determined quantitatively by ICP-AES (Varian Liberty Series II). ICP-AES was calibrated with High Purity Multi Standard (Charleston, SC 29423) solution with a multi point calibration curve. Stock phosphorus solu-tion (1000 mg/L) was prepared from AR grade KH2PO4 (supplied from Merck). A 100 μl aliquot of concentrated ultra pure HNO3 (65%) was added to each 100 ml of standard solution. Fur-ther dilutions were prepared from the stock phos-phorus solution to prepare a multi point calibra-tion curve. The Statistical analysis was performed with SPSS 11.5 by using t-test and one way ANOVA (α=0.05). Before the statistical analyses, the data were checked out for the homogeneity of vari-ance. 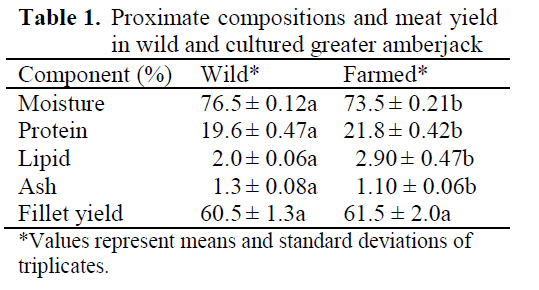 Meat yields in wild and cultured greater am-berjack were found to be 60.5% and 61.5% re-spectively (Table 1). Meat yields of both fish seemed almost the same however, proximate composition of both fish differed statically sig-nificantly (P<0.05). Most cultured fish, such as trout, sea bass, and sea bream contain more lipids in the muscle and in the viscera. This depot fat in the viscera may be due to over feeding or feeding the fish with a high lipid containing diet. Unlike the meat yield of both fish in this study, the proximate composition varied greatly. Wild fish generally tend to have high moisture content and low lipid levels whereas, the cultured fish had low moisture content, and high lipid lev-els (Table 1). As indicated in Table 1, moisture and protein contents of both fish differed signifi-cantly (P<0.05). Lipid levels of wild and cultured fish were also had some differences (P<0.05). Lipid levels in cultured fish were 2.9% and 2% in wild fish. According to Ackman (1994), both cultured and wild greater amberjack may be categorised as a low fat fish (2-4%), relative to their fat content. Usually, cultured fish tends to get more fat with their diet (20% lipid). In cages, the fish will have a limited space for swimming activities thus; en-ergy expenditure would be less than wild fish and food availability much greater than in the wild environment. Therefore, excess energy may de-posit as a fat in the muscle or in the viscera. Pre-vious studies showed that cultured sea bass and gilthead sea bream have more fat and less mois-ture than their wild counterpart (Alasalvar et al., 2002). The result of present study showed a good agreement with the literature values that given for wild and culture fish, in particular high lipid content of cultured fish compared to its wild counterpart. Flesh colour is a very important quality indi-cator factors in some species such as salmon, trout, and tuna for the consumer’s aspect in many markets. For this reason, colours of the both wild and cultured greater amberjack were investigated in this study. In our preliminary work, glossy yellowish flesh colours were observed in parasite infested cultured greater amberjack compared to wild fish which had a peculiar pale red colour. It was considered whether the flesh colour can be used as a rapid method to discriminate farmed amberjack from wild amberjack. However, visual inspections and the colour measurements (Table 2.) indicated that flesh colours of both wild and healthy farmed amberjacks were similar. Fading in the flesh of cultured fish in the preliminary work may be due to parasite infestation the fish and luck of the blood in the tissue. It was also noticed that glossy yellowish colours in the flesh may probably be due to parasite infestation of the cultured specimen. L* values in both cultured and wild fish were similar at 95 % level (P>0.05) and also L values in the anterior, posterior and caudal parts were almost the same for both fish. There was no dif-ference between wild or cultured on L* value nor did this value show any significant differences in anterior, posterior and caudal parts. Similarly, Chroma value showed similar pattern as L* value in both farmed and wild amberjack. Chroma value tends to be high in anterior part and slightly low in caudal part but not significant at 95% level (P>0.05). However, Hue value was changed sig-nificantly in different anatomical part of the fish. It was similar in the anterior and posterior parts of the flesh, but it was significantly different in the caudal part of the flesh and this value was much higher in the caudal side than in the ante-rior and posterior parts of the flesh. Hue value seems to be a good indicator to discriminate as to whether the flesh belongs to the anterior or poste-rior part, however, based on the data of this study, Hue value may not be considered as a use-ful tool to discriminate whether the greater am-berjack flesh originated from the wild or was farm raised. It should be noted that visually, farmed fish skin was darker than that of wild fish. Fatty acid profiles of wild and cultured Med-iterranean greater amberjack are presented in Ta-ble 3. Among the 24 fatty acids, only C14:0, C20:2 n-6, C20:3 n-6, C20:5 n-3, and C22:5 n-3 fatty acids were same in wild and cultured fish (P>0.05). The remaining fatty acids were significantly dif-ferent (P<0.05) when comparing cultured and wild Mediterranean amberjack. The levels of total saturated fatty acids in wild greater amberjack were found to be higher than in the cultured fish. Among the saturated fatty acids; palmitic (21-16.6%), stearic (9.67-7.33%), and myristic acid (2.22-2.35%) were the most prominent fatty acids in wild and cultured fish, respectively. Total monoenes were 25.4 and 27.61% level in wild and cultured fish respec-tively. Total PUFA were 38.4% in wild fish, 35.4% in cultured fish, and 40.45% in commer-cial diet (Table 3). In general, fish contains greater amount of oleic acid than vascenic acid. The oleic acid level of farmed amberjack was found to be higher than that of wild amberjack. The level of vascenic acid in both farmed and wild specimen was much lover than oleic acid, but it was higher in wild than in the farmed amberjack. Elution of oleic acid and oleic acid are very close and sometimes these two fatty acids overlap. Separation these two fatty acids in the GC solely depends on the efficiency of capillary column and temperature programme. The total sum of oleic and vascenic acids in the wild and farmed amberjack were similar (P>0.05) with a levels of 20.5% and 19.5%, respectively. A similar result was re-ported by Grigorakis et al., (2002) in gilthead sea bream, whereas Mnari et al. (2007) reported the contradictory result of these two specific fatty acids for both cultured and wild gilthead sea bream. Wild greater amberjack contained low level of linoleic and linolenic acid in comparison to farmed fish (Figure 1 and 2). The level of linoleic acid (C18:2 n-6) in farmed greater amberjack was almost ten times greater than in the wild counter-part. Linoleic acid (LA) is the most abundant polyenoic acid and is widely distributed in com-mon vegetable oil such as soybean, sunflower oil, corn oil and sesame oil (Chu and Hwang, 2002). A high level of linoleic in the flesh corresponded to the artificial feed used for feeding farmed greater amberjack. Similarly, a high level of LA in farmed turbot compare to its wild counterpart was reported by Aubourg, Losada and Ricardo (2007) and in farmed sea bass compared to its wild counterpart (Fuentes et al., 2009). An ele-vated level of LA compared to linolenic acid causes a depletion of the longer chain omega-3 fatty acids, including DHA, by competing for the enzymes necessary for de-saturation and elonga-tion (Horrocks and Yeo, 1999). Adding oil of plant origin into the fish feed as an energy source is a common practice for fish feed manufacturers. Essentially, all vegetable oil diets will increase dietary C18:2 n-6 in comparison to fish oil diets; this has been a widely reported observation in salmon tissues, especially in the liver (Pratoomyot et al., 2008). However, a simi-lar phenomenon has not been generally observed with C18:3 n-3. Therefore, increasing dietary C18:3 n-3 levels have not been able to maintain tissue EPA or DHA at levels obtained in salmon fed fish oil (Pratoomyot et al., 2008). In contrast to these findings, high levels of LA, LNA was re-ported in wild Japanese eel compare to farmed eel (Oku et al., 2009). Erucic acid (C22:1 n-9) was the only mono un-saturated fatty acid that present in farmed greater amberjack with a level of 1.38%. This specific fatty acid appeared in the fish feed about 3 % of total fatty acids. The presence of erucic acid in farmed greater amberjack and its absence in the wild fish indicates that this particular fatty acid may also be considered as an indicator fatty acid to distinguish farm raised greater amberjack from the wild counterpart. The presence of erucic acid in farmed yellowtail was reported by Sohn et al., (2007). Among the n-6 fatty acids, arachidonic acid (ARA) was the more prominent fatty acid in the wild greater amberjack (Figure 1) whereas it was the second major n-6 fatty acid in the cultured fish. The level of ARA (C20:4 n-6) in most of the wild fish living in Arabian Gulf was reported to be much greater than LA (Kotb, et al., 1991) and in muscle from all the deep-sea fish species in North Atlantic (Økland et al., 2005). The propor-tion of these two fatty acids may show changes among the species or in different part of the world. Higher levels of ARA in wild fish com-pared to the farmed fish have also been reported previously by (Fuentes, Fernandez-Segovia, Serra and Barat, 2009). In wild fish there is prob-ably a higher intake of ARA than in farmed fish, coming from the crustaceans and mollusc in-gested. Human body synthesizes ARA from the essential fatty acid linoleic acid (C18:2 n-6), but the rate of synthesis does not always satisfy the demand. ARA can be obtained from the diet be-ing present in sources such as meat, fish and eggs but its concentrations are very low (Nisha et al., 2009). Thus, consumption of wild fish may be considered as a complementary source of ARA for human nutrition. The levels of EPA (C20:5) and DPA (C22:5) which are omega-3 series of fatty acids were similar (P>0.05) in both farmed and wild greater amberjack. EPA is one of the most abundant omega 3 fatty acid in fish oil. An unknown peak appeared before elution order of C22:5 n-3 (DPA) in the chromatogram, and this peak was calcu-lated almost three times greater in the wild fish than that of farmed amberjack. This unidentified peak in the chromatogram probably either be-longs to polyunsaturated fatty acid of carbon 21 or 22 chain. DHA (C22:6 n-3) level was found to be signifi-cant in wild greater amberjack than its farmed counterpart. DHA is required in the nervous sys-tem for optimal neuronal and retinal function and influences signalling events which are vital for neuronal survival and differentiation (Kim, 2007). The ratio of DHA to EPA varies among species or among individuals. Thus, fish species with a high content of n-3 FA in the muscle is not necessarily a good source of DHA (Økland et al., 2005). The ratio of n-3/n-6 fatty acids in wild and cultured greater amberjack was found to be 5.50 and 1.86 respectively. Total n-6 fatty acids were much higher in farmed amberjack than its wild counterpart. 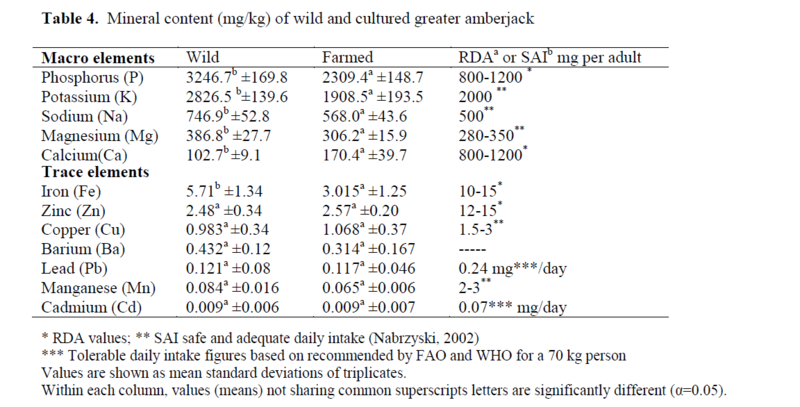 Total n-3 fatty acids were almost same in both wild and cultured greater amber-jack. 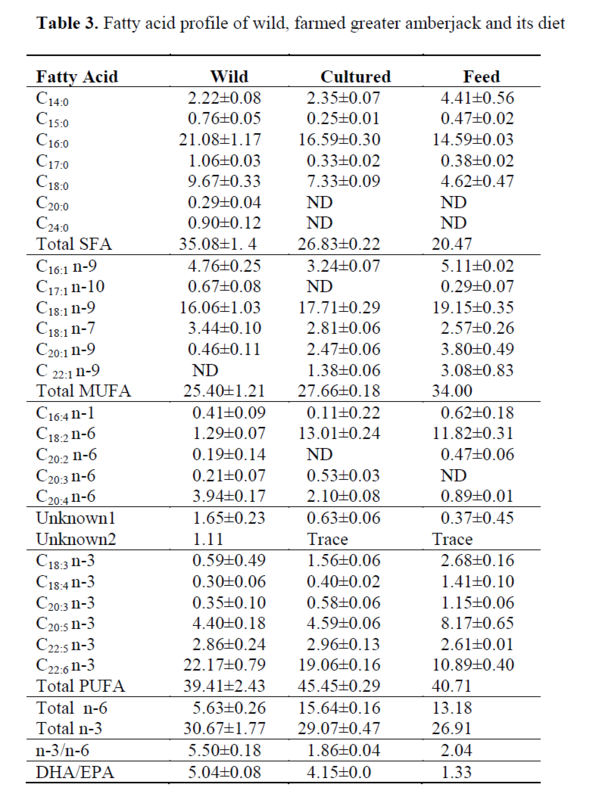 Among these fatty acids only the levels of EPA(C20:5 n-3) and DPA (C22:5n-3) were similar in both fish, but the remaining n-3 fatty acids were significantly different from each other (P<0.05). Several clinical intervention studies support the view that decreasing the n-6/n-3 FA ratio results is an increased protection against de-generative diseases (Simopoulos, 2002; Si-mopoulos, 2006). From this point of view, a high n-3/n-6 level is recommended in favour of healthy living. Findings of this research show that wild fish contained significantly higher lev-els of n-3/n-6 ratio than the farmed fish. Thus, a desirable high level of n-3/n-6 ratio can be ob-tained by consuming more wild fish than farmed fish. This ratio of n-3/n-6 was lowered in farmed fish having a high level of omega 6 fatty acid (linoleic acid) in their lipids compared to its wild counterpart. Cooking methods for the fish such as frying the fish with vegetable oil may also affect n-3/n-6 ratio due to oil uptake during frying. The macro and trace element composition of wild and cultured greater amberjack are depicted in Table 4. Phosphorus, potassium, sodium, mag-nesium, and calcium are all considered as macro elements, which are present in the fish muscle as mg/kg or g/kg quantities. Phosphorus is the most abundant mineral, followed by K, Na, Mg and Ca in both cultured and wild fish. It is well known that fishery products are rich in phosphorus and potassium. Average phosphorus concentrations in wild and farmed amberjack were found to be as 3247 and 2309 mg/kg respectively. Consumption of one hundred grams of fish portion may pro-vide almost half of daily phosphorus requirement of a human body (Table 4). Magnesium is widely distributed among the foods, and it ranges from 250 to 760 mg in each raw edible kg of fish (Silva and Chamul, 2000). Magnesium is an essential element for organisms for oxididative phosphorylation and activates many enzymes. The safe and adequate daily in-take of magnesium is about 280-350 mg for an adult person (Nabrzyski, 2002), and RDA value for magnesium is 400 mg (FDA, 1994). Fish seems to be a good source of magnesium. Mag-nesium contents of wild and greater amberjack were determined as 386 mg/kg and 306.2 mg/kg respectively (Table 4). The concentration of magnesium was significantly higher (p<0.05) in wild amberjack than in the farmed specimen (Ta-ble 4). Approximately 100 g of fish may provide almost 10% of daily magnesium requirement for human. 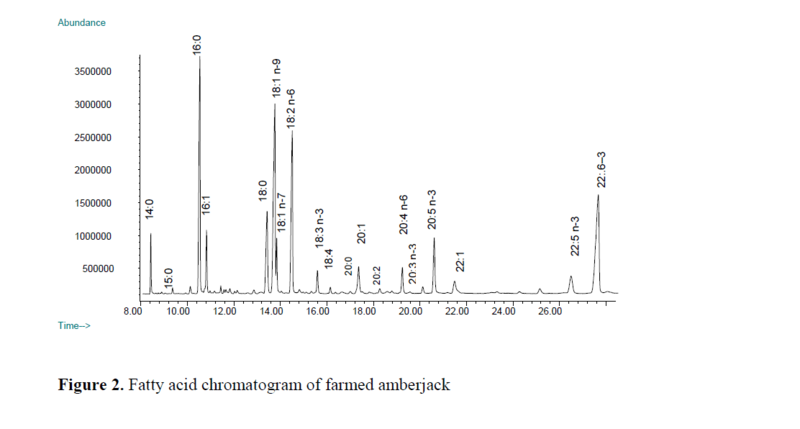 Results showed that the wild greater amber-jack contained higher levels of macro elements than in the farmed fish with an exception of cal-cium. In contrast to the present study, Roy and Lall (2006) reported a higher level of Ca in wild haddock than in farmed haddock. 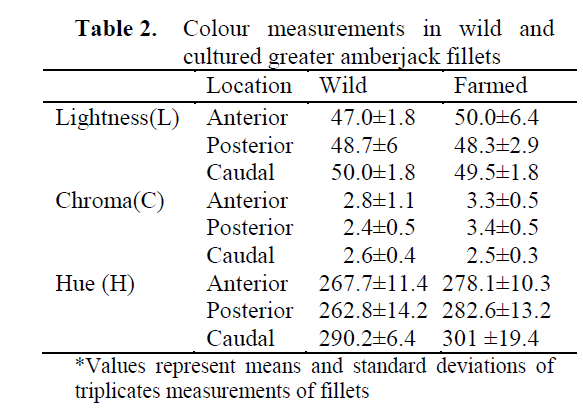 The Calcium level was significantly higher (p<0.05) in farmed amberjack than in the wild counterpart (Table 4). Calcium is an essential macro element and it is present in the structure of bone and teeth. Cal-cium is present in a healthy human body at about 2% of total body mass. Dairy products are rich in calcium compared to seafood. The daily require-ment of calcium for an adult person is about 800- 1200 mg. Considering the daily requirement of calcium of human, fish can be seen as a poor source of calcium except some small pelagic fish that are canned whole or consumed with their bones. There is evidence from studies in experi-mental animals as well as in human subjects that dietary calcium competes with lead absorption in the gastro intestinal tract. This leads to suggest that persons with the high calcium intake may be partially protected from the toxic effects of lead exposure because they will absorb less of it (Miller, 2008). Absorption of calcium is another aspect that needs to be considered. Oxalic acid, like phytic acid, reduces the availability of biva-lent cations and may cause Ca deficits via com-plexes. Dietary fibres can affect calcium, magne-sium, zinc and phosphorus absorption by acting like ion exchangers and binding minerals (Omaye, 2004). Fe, Zn, Cu, Ba, Pb, Mn, and Cd are the main trace elements analysed in the present study. Iron is one of the crucial trace elements and its func-tion in the body is indispensable. 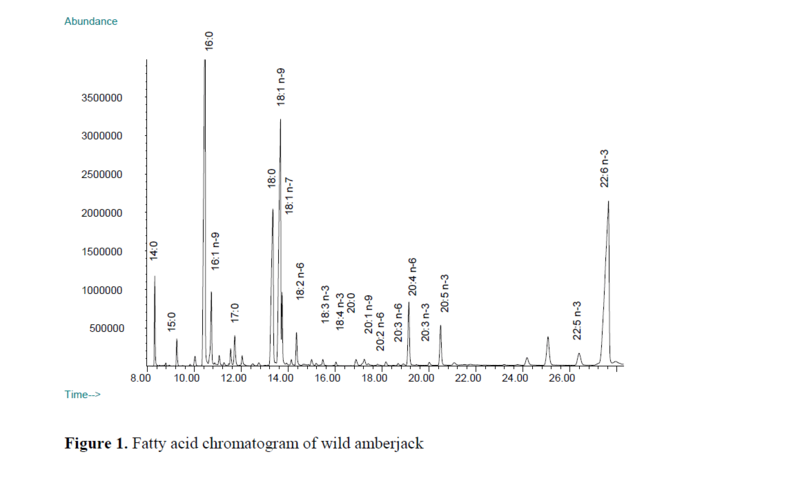 Iron contents of wild and cultured amberjacks were 3 and 5.7 mg/kg respectively. Wild fish tend to have a greater amount of iron than captured fish. Alasalvar et al., (2002) reported that, wild fish contained more iron than the farmed fish. The iron content of seafood shows great variance among the species. As a general rule, pelagic fish which have considerable quantities of dark mus-cle may contain greater amounts of iron due to dark muscle rich in haemoglobin compared to lean fish. Iron absorption inversely affected by some anti-minerals such as phytic acid, oxalic acid, glucosinolates, dietary fibre and gossypol (Omaye, 2004). Zinc is another important essential element and it is present active sites of many enzymes. It is also a natural component of many sea foods. The zinc contents of wild and farmed amberjack was about 2.48 and 2.57 mg/kg respectively. The zinc level did not show any significant difference with the raising conditions. The amount of zinc in greater amberjack was found to be much lower than some Mediterranean species reported by Uysal et al., (2008) but, similar to cultured sea bass reported by Erkan and Özden (2007). Cop-per is also an essential mineral and it is necessary for iron utilisation and haemoglobin formation; constituent of cytochrome oxidase and involved in bone and elastic tissue development (Na-brzyski, 2002). Copper toxicity may occur when the capacity of liver to bind is exceeded. Gastro-intestinal, distress has been seen with copper in-take of 5 mg/d. Weakness, listlessness and ano-rexia are signs of early toxicity (Omaye, 2004). The levels of copper were 1.068 and 0.983 mg.kg-1 for both cultured and wild greater am-berjack respectively and there was no significant differences (P<0.05) in the level copper that is present in farmed and wild fish. The levels of barium, cadmium, lead and manganese levels (Table 4) were similar (P>0.05) in wild and cultured fish. Barium is found in the environment mainly combined with oxygen, sulphur and carbon to from barium com-pounds. The EPA has set a limit of 2.0 milli-grams of barium per litre of drinking water (2.0 mg/L) Barium has been found to potentially cause gastrointestinal disturbances and muscular weakness when people are exposed to it at levels above the EPA drinking water standards for rela-tively short periods of time (ATSDR, 2008). The levels of barium in both fish were found much lower than the limit set by EPA for water. Cadmium and lead are well known toxic met-als. As indicated Table 4 the levels of the two el-ements did not exceed the limit set by EU. Chil-dren are more vulnerable to lead poisoning than adults. The Joint FAO/WHO Expert Committee on Food Additives established a provisional tol-erable weekly intake (PTWI) for lead as 0.025mg/kgbw (FAO, 1983). Whereas the Euro-pean Community (COMMISSION REGULATION (EC) No 466/2001EEC) estab-lished the maximum levels of lead in seafood as 0.2 mg/kg for all species except eel, horse mackerel and sardines: all 0.4 mg/kg and prawn crab (claw meat) and lobster meat: 0.5 mg/kg. Cadmium (Cd) 0.05 mg/kg for all species except eel, horse mackerel, and sardines: all 0.1 mg/kg. The maximum limit for crab (claw meat), lobster meat, and prawn is 0.5 mg/kg. Lead and cad-mium contents of both wild and cultured greater amberjack were much lower than the limit set by EU. The present finding reveals that wild and cultured greater amberjack contain less heavy metal such as lead and cadmium. Consumption of these fish may be considered safe with respect to the heavy metals mentioned in the present study. Based on the results obtained, meat yield and flesh colour of wild and cultured greater amber-jack were almost similar. Proximate composition of wild and cultured greater amberjack varied with the environment in which they were raised. More lipids and less moisture were present in cultured amberjack in contrast to their wild counterpart. Fatty acid composition seems to be a very useful tool to distinguish wild fish from the farmed fish. Linoleic acid was the major fatty acid altering the n-3/n-6 ratio in the farmed due to presence of high level of this particular fatty acid. Erucic acid appeared only in cultured fish and its diet, and it was not detected any samples of wild greater amberjack. High level of LA in farmed fish may lower the nutritional quality of the fish by lowering n-3/n-6 ratio. This indicates that the formulation of fish feed needs to be con-sidered by manufacturers in order to provide bal-anced fatty acids to the farmed fish. Wild fish contained greater amounts of macro elements than farmed fish, with the exception of calcium. Also, iron was the only trace element signifi-cantly higher in wild fish than farmed fish. The remaining trace elements in wild fish were not significantly different from the farmed greater amberjack. The author wishes to thank Mustafa Kemal University, Laboratory of Applied Science, and Research Centre for mineral and fatty acid analy-sis and, to Dr. H. SEREFLISAN for providing farmed greater amberjack samples. This work has been written in dedication to the late Prof. Dr. Ibrahim OKUMUS. The author also wishes to thank Mr G.A. GARTHWAITE for critical re-viewing the manuscript. Ackman, R.G., (1994). Seafood Lipids, In: Sea-foods chemistry, processing technology and quality, Eds. F. Shahidi and R.J. Botta, 1st edition Chapman & Hall, London, 34-48 pp. AOAC, (1997). 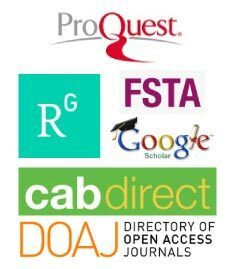 Official Methods of Analysis of Association of Official Analytical Chemists, Method 950.46, (16th edition), Software® Adobe and E-DOC/CJS, MD, USA. ATSDR, (2008). Agency for Toxic Substance and Disease Registry, http://www.atsdr.cdc.gov/toxfaq.html (ac-cessed October 10, 2009). Chu, Y.H., Hwang, L.S., (2002). Food Lipids. In: Z. E. Skorski (Ed), Chemical and functional properties of food components, chapter 6, CRS Press, Florida, 115-132 pp. Deniz, H., Okumus, I., Gier, G.Y., (2009). Tür-kiye deniz ürünleri yetistiriciliginde ekosis-tem yaklasimli yer seçimi ve alan tahsisi için yol haritasinin gelistirilmesi, 15. Ulusal Su Ürünleri Sempozyumu, 1-4 Temmuz, Rize- Turkey. FAO, (1983). Compilation of legal limits for haz-ardous substances in fish and fishery prod-ucts, FAO Fishery Circular vol. 464. Hanson, S.W.F., Olley, J., (1963). Application of the Bligh and Dyer method of lipid extrac-tion to tissue homogenates, Biochemical Journal, 89: 101-102. Hutchings, J.B., (1994). Food Colour and Ap-pearance, Chapter 7, Blackie Academic& Professional, an imprint of Chapman & Hall, Glasgow. pp. 198-237. Miller, D.D. 2008. Minerals. In S.D. Damodoran, K.L. Parkin, O. R., Fennema. Fennema’s Food Chemistry, Chapter 8, Taylor & Fran-cis Group, CRS Press, 523-570 pp. Okumus, I. 2007. The marine aquaculture and management in Turkey. http://www.easonline.org/files/Meetings/ma-rine_aquaculture_management_in_turkey.pdf (Accessed October 15, 2009).